We need balance. Our body is constantly looking for it, sometimes going to great lengths to achieve it. The consequences of an imbalanced system, especially regarding its internal acidity, can be devastating. The body is very sensitive to its pH level. If our body pH becomes too acidic (pH below 7.35), proteins are denatured and digested, enzymes lose their ability to function, osmosis stops and even cell death may occur. Low energy, fatigue, excess weight, poor digestion, aches and pains can be a consequence of high blood acidity. To stay balanced, the body must alkalise through minerals like calcium, potassium and magnesium, “stealing” them from vital organs and bones. Long-term acidity is like rust: slowly but surely, it corrodes our body. Making sure we keep a balanced internal pH is essential for our wellbeing. Most modern lifestyles are acidic. There are a lot of factors that contribute to high acidity levels, such as lack of exercise, stress, pollution and even our emotions. But mostly, it’s what we eat and drink that has the biggest impact. Some foods are alkalising whilst other have acidifying properties. Because 70% of our body weight is water, increasing the pH level of our drinking water could prove very beneficial to help our body find, and keep, healthy acidity levels. And this is where the HomePure’s Alkaline Stick comes into play. 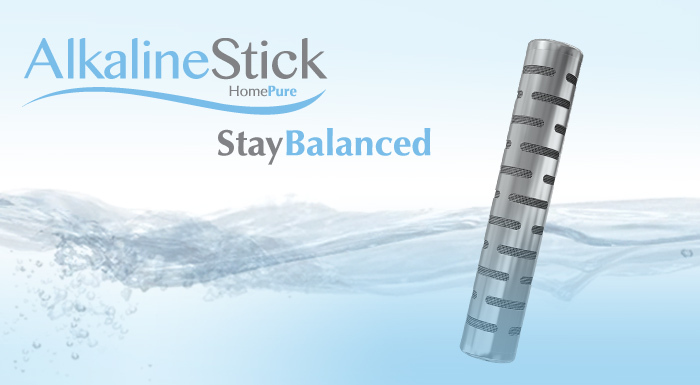 Lightweight and portable, the Alkaline Stick alkalises plain drinking water to promote your health and well-being. Inside HomePure’s Alkaline Stick, there are thousands of ceramic balls, tested and approved by NSF International for their alkalising properties. These ceramic balls react with the molecular structure of fresh water, creating an abundance of negative ions that counterbalance the body’s acidity levels. Making sure we keep a balanced internal pH is essential for our well-being. 1. Place the Alkaline Stick in a container of clean water and close the container. 2. Let the stick sit in the water for about 3-5 minutes for every 500 ml of liquid. 3. Remove the stick and drink the alkalised water within 3 days. • Do not use in polluted water. • For better taste, use filtered water. • Clean and wash the stick before using it. It is recommended to wash with water mixed with vinegar. • Keep the stick dry when not in use. For hygienic reasons, always place it in the plastic container given. • Replace every 6 months or every 400 litres of water alkalised, whichever comes first for optimal performance.